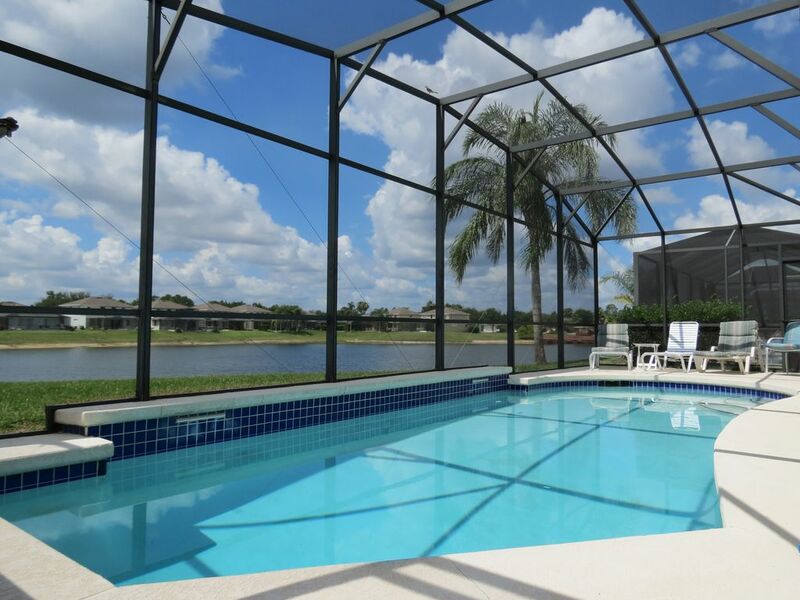 Godetevi questa splendida casa di 4 camere da letto 2 Bathfront lago che può ospitare fino a 10 persone nella bellissima comunità gated Sunset Lakes. Siamo situati vicino a tutte le principali attrazioni. Siamo a soli 5 minuti dal Walt Disney World Resort ea circa 15 minuti dagli Universal Studios e dal Sea World. Questa casa comprende una cucina completa, 2 box auto, piscina riscaldata esposta a sud, lavatrice / asciugatrice, televisori in ogni camera da letto. TV e lettore DVD in soggiorno. C'è una tavola multifunzione che include Foosball, piscina, ping pong, hockey su air, shuffleboard, bowling, backgammon, scacchi e scacchi. C'è anche una tavola da tiro, tavolo da ping pong e una console Playstation1 con giochi. C'è un parco giochi per bambini e bacini di pesca a pochi metri dalla porta d'ingresso. Un portatile / culla e seggiolone portatili sono disponibili per la vostra convenienza. L'area di Orlando è una destinazione di classe mondiale che ha tanto da fare, che ogni membro del tuo gruppo può divertirsi a proprio modo. I parchi a tema includono; Il Walt Disney World Resort, gli studi universali / isole di avventura, il mondo del mare, i giardini di LegoLand / Cypress, la costa di Discovery, il Cape Canaveral, l'esperienza della Terra Santa e molto altro ancora. Ci sono spettacoli di cena e cena che sono ineguagliabili. La vita notturna abbondante e alcuni dei migliori spettacoli attende. La piscina ha una doccia esterna. This is the second time we stayed at this property. Very clean and comfortable. Close to everything! Only thing I would recommend is some the the light bulbs need to be replaced. Enjoyed the stay and felt at home. Thank you. We are thrilled you enjoyed your stay. We really like staying at this house. The house is clean. Nice to have the view of the pond beyond our pool. My husband and grands like the fishing. Things get updated. The only issue is getting the pool warm before we get there. As always, it was a pleasure to have you stay at our Sunset Lakes home again. We are happy you liked the updates we have made. It is unfortunate the pool wasn't as warm as you like, but when its unusually cold, it takes a little longer to heat the water, even with a cover on. We do look forward to having you return again in the near future. Firstly let me say thank you for the use of your villa in July. We have been going to Florida since 1980 and have now racked up in the region of 25 visits including about a dozen Villas so any comments which follow are meant to be constructive. There are not enough towels provided so we were constantly washing them. We were a party of 4 so can’t imagine how 10 would cope. We also had to buy extra clothes hangers as there weren’t enough supplied. Once washed we had to tumble dry them and our bathing costumes as there was no ‘clothes horse’ inside or out. We ended up buying string and making a temporary washing line in the garage. There was a lack of crockery, barely enough for 4 people causing the constant use of the dishwasher. We asked if there was a safe in the Villa beforehand and you replied that the Management Company said they were too much hassle. A safe (which was provided in all other Villas) is for the peace of mind of the renter not absent because of any so called inconvenience to the Management Company. The pool area was a little grubby and could do with a good clean. In summary the Villa was basic and overpriced for the model and location both of which we have stayed in for the last 7 years. I am sorry our home did not meet your expectations. The photos on this listing are all current and are an exact representation of our home. You were informed BEFORE making the reservation that there was no safe available. We also have a large supply of towels and kitchenware to accommodate more than 10 people. (The capacity of the home). This is a self catering home and a washer, dryer and dishwasher is provided for your convenience free of charge. You were also provided with a number to reach our property manager available 24/7 to assist you with any needs. He lives in the same community and would have been more than happy to provide you with anything should you have called him. I am sorry you did not take advantage of this service. We strive to make all guests happy and want nothing more than for their experience to be a pleasant one. My family and I spent a wonderful weekend there! Beautiful house, amazing pool, view to lake, close to everything!!! We will return for Sure!!! If you are looking for a place like home , you just found it!!! I am thrilled you enjoyed your stay! We look forward to having you stay with us in the future. Not fully as expected . Our family has vacationed in rental accommodation on Sunset Lakes for the last ten years . We notice a huge difference in standards between rental only properties and owner/user rental properties . This villa falls within the former and it really shows . The kitchen and bathrooms are looking tired and need refurbished , the standard of bedding and towels is low quality and the pillows are stained and need replaced , hopefully with protectors . Crockery would be insufficient for full occupancy ( 4 mugs ) and no children friendly cups or beakers . TV's in the bedrooms are antiquated . The villa is well positioned however the villa next door is in a dilapidated state with a pool half full of green gunge ( not pleasant ) . In summary there are far better villas on Sunset Lakes than this one . I'm sorry you were not pleased with our Sunset Lakes home. We do our very best to meet standards and we will look into the things you had pointed out. Unfortunately we do not own the property next door and have no control over how they take care of their home. Thank you for your input.